Olive oil has been produced throughout the world since 4000 B.C. Why has it sustained such longevity? What's the secret behind this liquid gold? Let's start from the beginning. We're answering questions like "What is olive oil? ", "How is it made? ", and "Is there a difference between extra virgin and other olive oils?". This comprehensive guide will walk you through everything you need to know about this bountiful product. Why is olive oil made? We've all heard of olive oil. But how much do we really know? There is a tremendous amount of confusion and misunderstanding among consumers that leads to mistakes in buying, tasting and using olive oils. We've heard it's good for you, or maybe that it is not so good for you. We've heard one type is preferred over another. We've heard that it is best used in this dish over that dish, only for this and never for that...There are endless questions and concerns that need addressing around the grand topic of "Olive Oil", so we are here to guide you on the extra virgin path when it comes to all things olive oil. 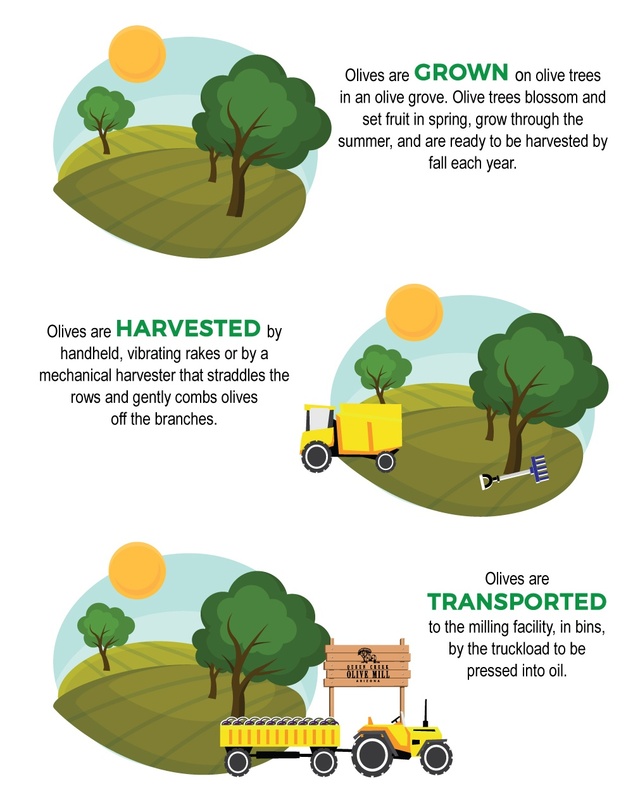 Today, olive oil is produced all over the world, but like all things, it had humble beginnings. Olives have been cultivated for over 6,000 years, originating in the Mediterranean basin - an ideal climate for the crop. From there, the tree spread throughout Africa, and eventually to the Americas and into Australia in the last two hundred years. The olive tree is among the oldest known cultivated trees in the world - these trees were grown before the written language was invented! Archaeological evidence shows that olive oil was produced as early as 4000 BC - talk about tradition! The olive tree is one of 4 plants (grape vine, date and fig) that comprise the oldest group of plants used in the Old World. The trees were a staple among numerous cultures for all that they had to offer to the people cultivating them. 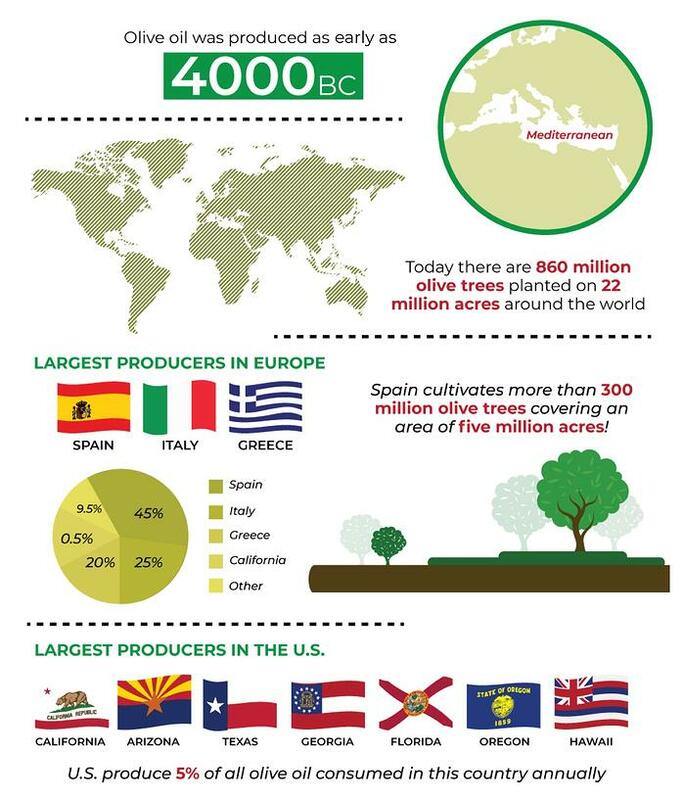 Today, there are about 860 million olive trees planted on 22 million acres around the world. Olive trees grow best in dry, arid climates that don't see much rainfall. The countries in the world that produce the most olive oil are Spain, Italy, Greece, Turkey, Tunisia, and Portugal. The majority of these countries are part of the Mediterranean region - this region of the world has the best climate for the growth and development of these trees, which is why these countries are the top producers worldwide. Worldwide olive oil production and trade standards are set by the International Olive Council known as the I.O.C. in Madrid, Spain. These standards require specific chemical makeup and the presence of certain sensory attributes for all classifications of olive oil. Olive Oil has been a staple throughout history. As a key part of the Mediterranean diet and as a food, it was used by everyone - peasants, aristocrats, royals - it was a very commonly used ingredient because of its availability and versatility. There are also many alternative uses of olive oil besides cooking such as medicinal practices, religious rituals, skin care, and many other applications. Hippocrates was one of the first documented medicinal practitioners to use olive oil in topical ointments to support the healing of skin troubles. Traditionally, the wealthy would use olive oil for bathing and massage - athletes would use it similarly to recover from intense physical exertion after partaking in the ancient Greek games. Olive oil soap was used traditionally as well, it may not be the olive oil soap seen on the market today, but it is said that the Egyptians made and used a soap-like substance from vegetables oils, including olive oil, to cleanse their bodies. Today, olive oil skin care products are found all over the market because of olive oil's time-tested healing capabilities. Symbolically, the olive represented new beginnings, renewed life and peace. The oil played a significant role in economy, technology, arts and international trade throughout the world. Olive oil was woven into many world religions and cultures as well, used in anointing for baptisms and other sacred rituals. In fact, the olive tree was brought to the American West by Christian missionaries for both consumption and ceremonial purposes. Olive oil's versatile nature and healthful properties have helped sustain it's popularity throughout history and in today's society. As of late, science has only been proving the health benefits of olive oil and its traditional uses. It has been found that extra virgin olive oil is a staple to longevity, a healthy heart, a reduction in LDL cholesterol while increasing HDL cholesterol, it is strongly anti-inflammatory and supports brain health. There are numerous health benefits to this "liquid gold" which is why is continues to be used around the world for cooking, drizzling, moisturizing and much more. Pruning: Starting in January, we prune our trees in order to maximize olive production. Blossom: The trees blossom around mid-April by producing small clusters of tiny cream-colored flowers. Although bees and other insects can help, olive trees are primarily wind-pollinated plants. Studies have shown that at full bloom about a half-million flowers are present on a mature olive tree and commercial yield is achieved if just 4% of those flowers remain. Fruiting: Olives are the fruit of the olive plant. Once the fruit sets, the olives grow throughout the summer months until they reach full size. As olives ripen on the branches, they change from green to a purplish color. Harvesting: Harvesting generally begins in mid-October and lasts through mid-December depending on the varietal and climate factors that year. How the trees are harvested depends on the grove configuration. When the olives are ready, they are harvested one of two ways: by handheld, vibrating rakes or by a mechanical harvester that straddles the rows and gently combs olives off the branches. Olives are then transported to the milling facility, in bins, by the truckload to be pressed into olive oil. They get pressed within a 24 hour period from the time of harvest to ensure quality and freshness of the oil. The quality and freshness of the oil will eventually determine its classification (extra virgin, virgin, refined, etc.) but more on that later. The time of harvest is a very important variable in the style and quality of the oil. When an olive ripens it will begin at a green ripe stage then continue to ripen on the tree until it becomes purple ripe. 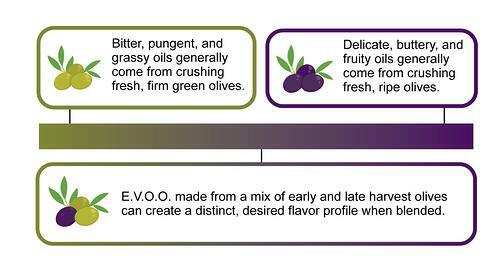 A green ripe olive will produce a totally different flavor profile of oil than a purple ripe olive even though it is the same variety. A green ripe olive will produce a grassy, robust oil with a lot of character whereas a purple ripe olive will produce a very buttery, fruity tasting oil that is bland…bland in the good sense of the word. It is very important that you understand this point because it is very important to pick the right varieties at the right time to get the desired character of oil. Fallen olives are never used. The olive is a fruit and the only reason a fruit falls from a tree is because it’s too ripe or it has been invaded by a pest. In general, harvesting should occur when the olives are in a light purple stage with about 60% color. When the olives arrive at the mill, they first go through a defoliation process where foreign materials are removed by sifting, vibrating screens and air blowing of the olives. Leaves and twigs are removed during this process. The second step is washing. The olives are dumped into a washing basin where they are vigorously shaken by bubbling air and water. This facilitates the removal of any dust and soil. The water is changed frequently to ensure optimal cleaning. The olives are then transferred to the Mill or Crusher. As the olives move through the Mill, they are pulverized by breaking the skin, pulp, pits which creates an olive paste. This is done in the olive mill, which is a hammer mill made of carbon steel blades housed inside a cheese-grater looking cylinder. The crushing of the fruit results in the olive paste which will then be deposited into malaxation containers. The RPM of our mill is monitored very specifically to ensure temperatures and the intensity of mechanical action are kept under control. (generally between 2500 - 2900 RPM). The paste will then get delivered to the malaxation containers. Malaxation is the initial phase of separation. The slow mixing of the olive paste causes a natural process to occur, in which the oil molecules start to separate from the solid parts of the olive and adhere to each other, becoming oil droplets, since oil has a tendency to attach to itself and separate from water and other solids. The slow blending process helps this to happen. The relationship of malaxation time and temperature is highly controlled to ensure optimal oil extraction and adherence to standards required by the International Olive Council. Then the centrifugal separation occurs. This is divided into two parts: the decanting phase and the disc separator. In the first phase the paste is delivered to the centrifugal decanter. The decanter looks like a silver bullet and is spinning very quickly about 3500 rpm. It is made of a stainless steel outer shell and an interior screw conveyor. Both the shell and the screw are rotating in the same direction but at different speeds. As the paste is introduced to the decanter, we will take advantage of the principle that oil is lighter than water. The oil will find a level, the water will find a level, and so will the rest of the solids. We will set an exit on the centrifuge to extract all of the oil and a little bit of the water (just to make sure we don’t lose any oil) The rest of the paste and water will get ejected from the machine out of the waste exit. The waste is called pomace and the pomace still holds some olive oil that cannot be extracted mechanically. (Large oil producers that can process up to 10 tons/hr will sell this pomace to refiners who extract the rest of the oil, refine it and sell it as refined pomace oil on the open market as a commodity.) Our pomace is ejected from the centrifuge, pumped up and out of the mill room, and deposited into a covered trailer outside where it is taken to repurpose as fertilizer or sprayed on dusty roads. Extra virgin olive oil comes out of the front of the centrifugal decanter. At this point the oil coming out of the machine is a little cloudy because it still has minute amounts of water and organic material left in it. This oil, water and organic material are then transferred to the disc separator. The final phase of separation of oil is completed by the disc separator. This process is carried out to make the oil as clear and stable as possible by eliminating excess water and organic material. EVOO is not like wine and does not get better with age so it is very important that the water and organic material is eliminated in order to stabilize the oil for maximum shelf life. The disc separator has a series of vertical discs that the oil will pass through in order to do its job. The olive oil is then stored in temperature controlled stainless steel tanks, which are free of oxygen and light, until it is ready to be bottled. Everything from the quality of the olives, the time from the field to processing, the extraction process, and the storage method are all important variables that affect the quality of the olive oil. Let's say you're standing in the aisle contemplating between 20+ different olive oils. You recognize some well-known brands right away while you feel unsure and apprehensive about other unfamiliar brands. Regardless, you're left with choices. Which is good, which is better, but most importantly, which is the best? ... And how can you tell the difference? 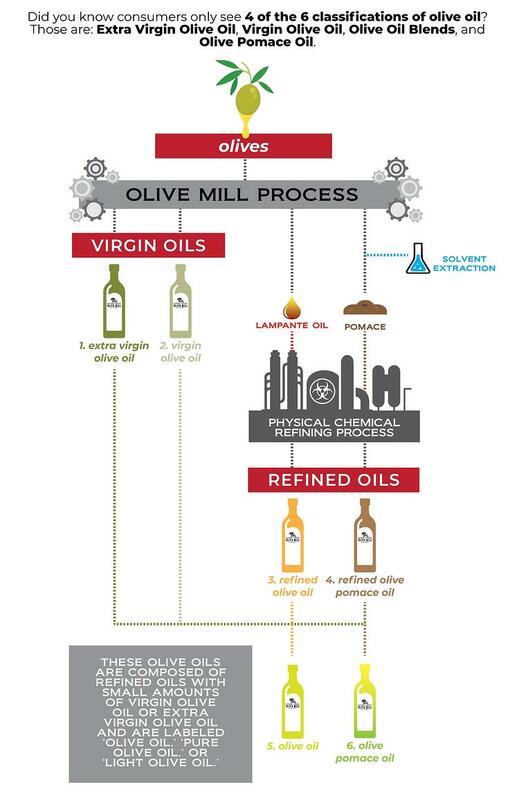 It's important to know the 6 different types of olive oil that can result from the extraction process. The 6 classifications of olive oil are; extra virgin olive oil, virgin olive oil, refined olive oil (from lampante oil), refined olive pomace oil, olive oil blends, and olive pomace oil. However, consumers only see 4 of these 6 classifications on the shelf. So how do all of these different olive oils come about? Well, it's all in the extraction process. A virgin olive oil that is extracted from healthy, fresh olives, purely by mechanical means, without the use of heat or solvents. It must have a free acidity (expressed as oleic acid) less than 0.8%. Extra virgin olive oil must meet both chemical and sensory standards (free of sensory defects) in order to be classified as extra virgin olive oil. Chemical standards are very stringent and include such variables as free acidity, peroxide and phenolic values along with a number of other variables. A virgin olive oil that is extracted from olives that have been subjected to poor harvesting, growing, and/or storage conditions. It can also be oil that may have been subjected to less than optimal storage conditions or oil from a previous year’s harvest. Virgin olive oil is lower in quality than extra virgin olive oil and has a free acidity between 0.8% and 2.0%. It typically will have some sort of sensory defect but is acceptable for human consumption. This oil is made from all those olives that don't quite make the grade for extra virgin; basically, all of the olives that may have fallen to the ground, gone moldy, fermented or been attacked by pests. The olives are such a low quality that the oil produced from them cannot be used for human consumption and must be further refined in order to become edible. Once this oil is refined it is referred to as “Refined Olive Oil”. This comes from the by-product or the waste residue from the milling process which is called pomace. The pomace still contains a small amount of olive oil that is impossible to extract by mechanical means. It can, however, be extracted with solvents; the raw oil is then refined using a method that is similar to that applied to lampante oil. The refined oil derived from pomace is called “Refined Olive Pomace Oil”. This is a blend of refined olive oil (from lampante oil) with either extra virgin olive oil or virgin olive oil to improve its flavor. This is a blend of refined olive pomace oil with either extra virgin olive oil or virgin olive oil to improve its flavor. Most consumers believe "Light" or "Extra Light" olive oil contains fewer calories than extra virgin olive oil. In fact, light or extra light oils are made up of 95% refined or pomace oil, and blended with only 5% extra virgin olive oil to give them some color and flavor. So, contrary to popular belief, the caloric intake is the same but the health benefits are far more plentiful in extra virgin olive oil than they are in the nutrient-stripped "Light" or "Extra Light" olive oils. Unknown to many consumers, olive oil has to meet both chemical and sensory standards. The qualities of fruitiness, bitterness, and pungency, as well as the absence of defects are necessary to qualify oil as extra virgin. There are only 3 positive sensory attributes associated with olive oil. Fruitiness - Using the nose as the sensory medium it can be described as green, medium or ripe fruit. Some common good attributes may be green apple, herbaceous, nutty, ripe banana or buttery. Bitterness - The sensation is apparent on the tongue soon after tasting. Bitter does not mean bad, it merely defines the profile of the oil. Pungency - The sensation that is apparent on the back of the throat after swallowing the oil. It will give the sensation of hot peppers in the case of a strong pungent attribute. Depending on the variety and maturity of the olives being crushed, there can be many different profiles associated with good-quality extra virgin olive oil. There are a number of negative sensory defects that can be associated with olive oil, and all of these deficiencies are related to poor growing, harvesting, processing and/or storage practices. Grubby - typical aroma of olives that have suffered a strong attack by the grubs of the olive fly. Hay-wood - produced from olives that are dried out, giving a woody characteristic. Earthy - typical aroma of oil obtained from olives that have fallen to the ground or dirty because they have not been washed. Fusty - typical aroma of oil from olives that have undergone an advanced stage of anaerobic fermentation. Winey/Vinegar - distinctive aroma of oil from olives that have undergone and advanced stage of aerobic fermentation. Musty - typical aroma of oils obtained from olives that have been affected by fungi or mold. Metallic - associated with oils that have been in prolonged contact with metallic surfaces during crushing, blending, pressing or storage. Heated/Burnt - characteristic flavor of oils caused by excessive and/or prolonged heating during processing. Rancid - flavor of oil that has undergone an intense process of oxidation. It is important to note that NONE of the 9 sensory defects can be present in an extra virgin olive oil. Olive oil made up of mostly monounsaturated fat (about 75%) which helps stabilize it and stand up to higher heat. The smoke point of olive oil is 410°F (210°C), which is ideal and safe for frying. Extra virgin olive oil actually has one of the highest smoke points of all ‘non-refined’ cooking oil and is one of the healthiest, most stable oils for frying! Heating olive oil does not effect the fat content or nutritional value before the smoke point. Extra virgin olive oil is packed with antioxidants called polyphenols which work to protect the oil from oxidation. The heat required to raise the temperature of olive oil high enough to fry food cannot change the chemical composition of olive oil. So when you sauté, grill or even fry, rest assured you're receiving all of the wonderful vitamins and antioxidants olive oil provides. The color of extra virgin olive oil has nothing to do with the quality. The color is influenced by a variety of factors including the growing conditions, type of olive and the time of harvest. Typically, extra virgin olive oil ranges in colors from yellow/green to green - and all of it is good for you! False. Unlike wine, olive oil does not get better with age. Fresh is best when it comes to olive oil, so be sure your bottle has the latest harvest date or bottle date available. We typically say to use it within 12-18 months of the harvest date - don't save it for a special occasion, use it everyday! All olive oil is not created equal. Extra virgin is by far the healthiest, tastiest type of olive oil that can be consumed. Olive oil, pure olive oil, or light olive oil have been refined and chemically altered - they are light in taste, quality and health benefits! It's important to be aware of these crucial differences when choosing which olive oil to cook with. Olive oil does not like light or heat. Store your bottle in a pantry or a cool, dark place - it's your best bet for keeping your olive oil fresh and reducing the deterioration rate. Dark, glass bottles also protect olive oil from harmful UV rays. 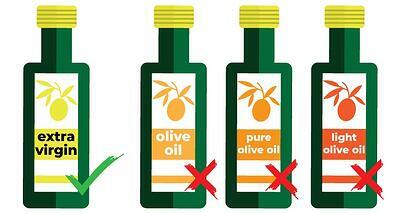 Some olive oil labels are misleading, others are wealth of knowledge...you just need to know what to look for. 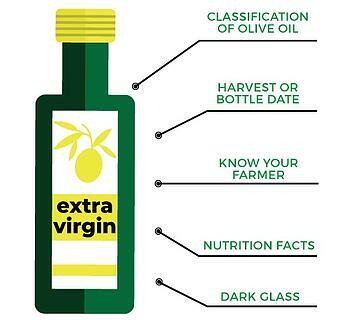 There are several key components to look for on a label when shopping for olive oil such as a bottle or harvest date, extra virgin in the name, and a location. So now, it may make a little more sense why the wonderful oil of the olive fruit has been such a staple throughout the history of mankind. 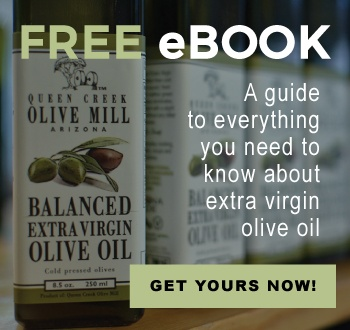 We hope this guide was informative and cleared up some long-time concerns on what olive oil really is and where it comes from. Please contact us if you have additional questions regarding this bountiful "liquid gold" at and we will be happy to answer any questions you may have!